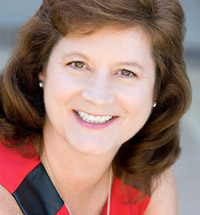 Adrian C. Ott, CEO of Exponential Edge Inc. consulting, is a top Silicon Valley business strategist and recipient of the Silicon Valley Enterprising Woman of the Year Award 2011 by the National Association of Women Business Owners (NAWBO-SV). She is also the award-winning author of The 24-Hour Customer: New Rules for Winning in a Time-Starved, Always-Connected Economy (HarperBusiness). Library Journal said, "Ott is revolutionizing marketing by adding the concept of time," naming it a Best Business Book 2010. The book also won the 2010 Editors Choice and Readers Choice Best Business Book Awards from Small Business Trends. A sought after keynote speaker at corporations, industry conferences, and business schools, Ott has spoken at TEDx Bay Area, HP Sales Conference, Harvard Business School Alumni Association, Intuit, Cisco Systems, Symantec, Association of Strategic Alliance Professionals, U.C. Berkeley's Haas School of Business, University of Ottawa Executive MBA Program, Stanford, and U.C. Santa Cruz. Ott has been interviewed on Bloomberg TV, The Washington Post, Forbes, and other major media for her groundbreaking work. Consulting Magazine called her "One of Silicon Valley's most respected (if not the most respected) strategists." She is a regular contributor to Fast Company and her work has been published in Strategy & Leadership Journal and others. She also chairs the Strategy & Growth Roundtable for the Harvard Business School Alumni Association of Northern California. In The 24-Hour Customer and related talks, Ott challenges businesses to reconceive their approaches to time and technology and win an unprecedented share of their customers' time, attention, and money. She explores the economics of customer time and attention, which she calls Time-onomics, and shows that time and technology have changed the competitive landscape. Smart companies must use them as strategic weapons. Packed with fascinating case studies and examples from leading-edge companies like Nike, Google Johnson & Johnson, and Facebook, Ott provides fresh ideas for capitalizing on the elements of time, attention, and value to create never-before-considered products, services, and programs - offerings that increase revenue, gain traction among consumers, and achieve competitive advantage. In doing so, she shows how business executives can change the way they think about their business - and their customers. Before founding Exponential Edge Inc., a top Silicon Valley-based consulting firm, Ott was an HP executive for 15 years who was recognized in an annual report for "infusing HP with new revenue streams, new technologies, and new business models." She holds an MBA from Harvard Business School and a B.S. from U.C. Berkeley. "Adrian graciously accepted the request to be the commencement speaker for Carnegie Mellon University - Silicon Valley in August, 2011. She was inspiring. She worked with the Dean to assure the content of her talk would be relevant and meaningful to the graduates. Both the faculty and the graduates in the Masters and Phd programs were delighted. Her talk was both insightful and entertaining. You could tell she was effective by the number of students who reached out to her after her talk. She has genuineness, intelligence, and integrity. These are the attributes that we hope are graduates can attain in their futures. I have enormous respect for Adrian's professional and leadership skills. It has been a pleasure working with her on this special occasion." "Adrian yielded impressive results through her in-depth knowledge of business that enables her to frame discussions and ask insightful questions that others may overlook. Her enthusiasm and professional approach earns the respect of senior executives." "Adrian is a master at synthesizing lots of data and noise to derive insightful trends and frameworks that enlighten and create ah-ha moments for everyone. Adrian is great at engaging executives and pushing their thinking, resulting in highly productive discussions and insights. Adrian is a top consultant in the Silicon Valley and I recommend her highly." "Adrian has a gift of taking complex concepts and making them intelligible and exciting." "Her presentation... was absolutely phenomenal and very well-received by our attendees... Ms. Ott's session was one of the most requested of the day. Her presentation was professional, relevant, and in tune with today's business environment." "Adrian blew my socks off! She is a veritable force of energy and insight and the whole room was mesmerized by her blend of pragmatic and inspirational comments." "Adrian is a superb presenter - enthusiastic, engaging, specific, and lots of examples." "I enjoyed your session today and meeting you. Thanks for addressing our AM Forum - you delivered exciting content with grace and authority." "It is rare that a book introduces a new concept that is scrumptious to strategy-oriented executives' appetites, but Adrian Ott's insightful 'Money Value of Time' makes you say, 'Of course! Why didn't I think of that!' The 24-Hour Customer is a thoroughly enjoyable and useful book." "In The 24-Hour Customer, Adrian takes the concept of time in a new direction by applying it as a strategic lever-one that can influence the design, positioning, marketing, selling and usage of your products and services in order to optimize your revenue streams. It is well worth your time to read it!" -- Peter van der Fluit, Senior Vice President Licensing, TomTom N.V.
"In The 24-Hour Customer, Adrian Ott offers a very new way of looking at things, which is both ground-breaking and pragmatic. She brilliantly observes that rather than looking only at market and product adjacencies, we should focus on time adjacencies - that is, engaging customers at those times when they are ready to take action and buy. A must-read for executives who want to succeed in today's fast changing marketplace." "The 24-Hour Customer by Adrian Ott is a timely and fascinating exploration of the 'fast paced electronic' times we live in. Resting on solid market research and clearly demonstrating how deeply our 'connected' society is affected by this new economy, this book is essential reading for any company that wishes to understand the future of the marketing, social interaction, and ultimately customer satisfaction and loyalty." 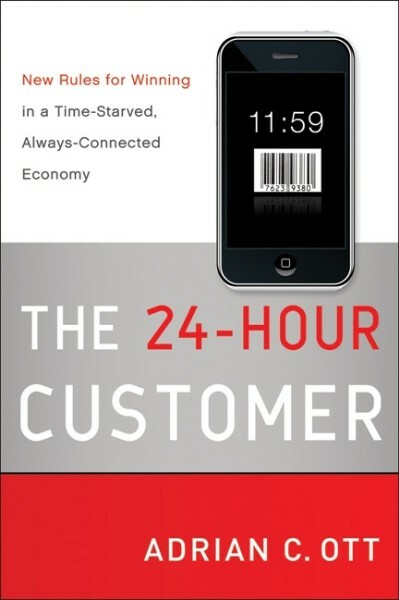 "The 24-Hour Customer puts into magnificent perspective the increasing role of time or, better, the lack of it, in purchasing and use decisions, and Adrian Ott brilliantly succeeds in providing a very unique and useful framework to analyze, understand, and put to work the time-related trade-offs we make. For executives in small and large companies alike, this book is not to be missed." "Ott's accessible tone and systematic strategies will be an eye-opener for companies wishing to drive through the constant marketing chatter and reach their increasingly harried customers." "Ott is revolutionizing marketing by adding the concept of time... [Her] eye-opening arguments will appeal to business readers who want their companies to remain viable in ever-changing and evolving marketplaces." "[Ott's] style is patient and nurturing as she conducts lessons that apply equally to consumers or businesses. Recommended for readers who want serious business improvement help." "I think [Philip] Kotler would appreciate Adrian C. Ott's The 24-Hour Customer... Ott has a thesis worth considering in the web-wide world we increasingly habit." "To many consumers, time is more important than money. Today's managers need to factor this key concept into their marketing programs. Adrian Ott provides the battle plan for doing so." "In her new book, Adrian Ott has hit the nail on the head in identifying the single most important and perplexing issue facing marketers today: how to effectively deal with the time starved, always connected consumer. Ott asks us to consider not only alternative products or services but alternative uses of time, and this brilliant insight is a conceptual home run. This should be must reading for any manager who wishes to acquire and retain customers in this new era." "The 24-Hour Customer contains a BIG idea that can payoff in BIG results. Adrian clearly demonstrates how today's multi-screen, multitasking culture is driving vast changes in customer behavior. Leaders who want to successfully compete in today's marketplace must read this book-and act." "Adrian's book outlines an innovative approach using a new lens to view the critical and increasing importance a customer's 'time' plays in their purchasing cycle. She uses this same lens to provide useful insights on how to design business strategies to create new market opportunities and achieve sustainable market position." "The 24-Hour Customer is a great read for any executive who needs to apply fresh thinking to products and solutions. Adrian's strategic perspective provides many 'lightbulb' moments, and, by reading this fascinating book, you'll come away with great new ideas to breathe more life and creativity into your marketing."